To market Deposit products for Consumer, Commercial & Corporate Sectors. To perform marketing activities through Cross Selling, Up Selling and Out Reaching. To plan and manage day-to-day marketing activities. To constantly review and expeditiously implement new strategies and action plans. Candidate must possess at least a Diploma or Bachelor's Degree in any related fields from a recognised college/univerisity. Please bring along a copy of updated resume with photo, original and copy of academic qualifications. For further information, please do not hesitate to call 03-2088 8271 or 03-2088 8298. 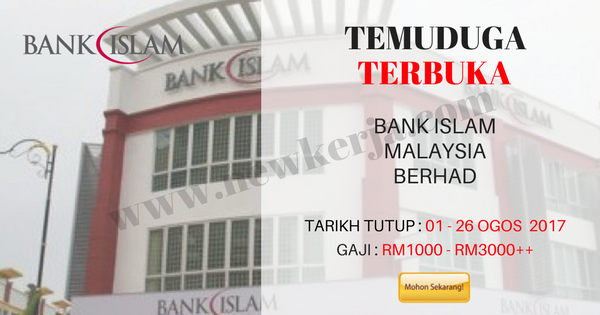 0 Response to "TEMUDUGA TERBUKA DI BANK ISLAM MALAYSIA BERHAD -PEL.NEGERI"